And now for something a bit different. 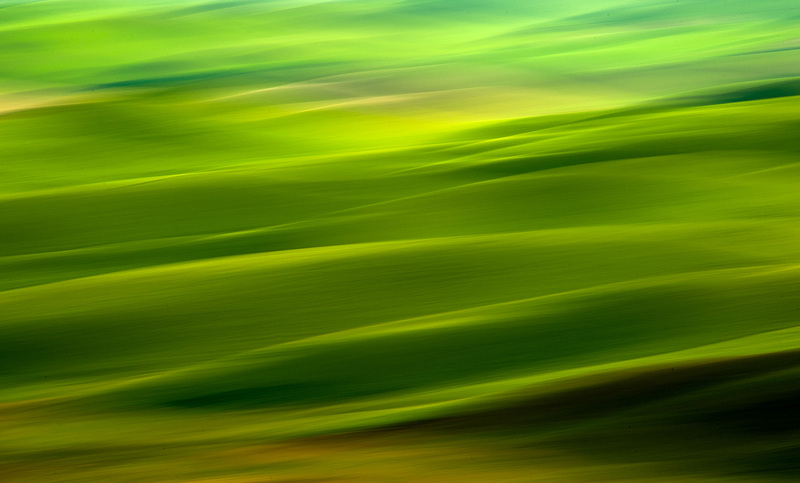 Not all images from the Palouse need to be tack sharp. Sometimes its fun to try “swipes,” a technique where you move your camera while depressing the shutter. Oft times you will need to shoot a number of them to get one “keeper,” but its worth it and they are fun to do. If you’re lucky you’ll have an unknown photographer near you wondering what on earth you are doing. If this happens, just smile and tell them you’re creating art! I am really enjoying your trip to the great NW. Looks like you were a bit shaky with this one. Yes! I love to do these, too! The green makes this especially beautiful. These techniques help allow the photographer to transition from a literal to an abstract artist. I do this all the time, but rarely find a result that fits into my artistic vision. However, where swiping is extremely helpful is to learn about the color, tonality and contrast in a scene without all seeing all the details. I love trying this. I often to it with vertical shots, especially trees. I personally love the result you achieved with this shot! Trees are great for swipes. I love this swipe, JB! I do these a lot (I call them blurs) but rarely have good success with horizontal ones – I do love them with trees. But this is beautiful – really emphasizes the light and shapes with great tonality. We sure missed you on this trip Rona. love, love, love…LOVE it…wish I was there in the Palouse with you and your group…next year!